In order to reach your audience with quality video content, you’re going to need to create relevant video content first. At the core of your video content creation strategy should be quality; creating a video that would be entertaining, informative, or engaging in some way, and make your viewers want to share it with others. These shareable videos will naturally draw in viewers, increasing the traffic to your channel, your website, and growing your overall brand awareness. A common roadblock for many businesses when it comes to having a stronger YouTube presence is the process of actually creating the content. Whether it’s coming up with the topics for their videos, or not knowing how much to invest into the production process of content. The key here is to remember that your video content will be representing your business. For many, the strategy that sounds the most appealing has to do with creating a video that can go viral and develop a huge amount of popularity in a short amount of time. While this would be ideal, going viral isn’t something that you should focus your entire strategy around, since there are too many factors that make it unpredictable. Instead, shift your focus to a more consistent strategy for having a strong YouTube presence in the long run. It goes right back to the idea of creating good, quality content that your audience will want to watch, and has a level of “shareability”. Videos that are shareable will get passed around naturally, which is the basis for going viral. The key is remembering that shareability must be complemented with quality content and visibility. Just like how having an amazing website doesn’t mean much if people can’t find you on Google, having quality video content is almost useless if they can’t find it when they search for it on YouTube. Always make sure that you give your videos clear titles and tags after you’ve uploaded them since these are the core elements for getting your videos in front of the users searching for them. Google can’t actually watch your video and determine what’s on it, so it relies on the text that you provide to determine what your video is about. Also, always be mindful when you’re inputting tags to ensure that they are relevant to the content in your video since you want to focus in on your target audience as much as possible. While titles and tags are fairly straightforward elements for optimizing your video, closed-captioning allows more opportunities to tell Google about the content of your video through text. While transcribing your videos may seem like a time-consuming process, it’s important to know that YouTube tends to rank transcribed videos higher since they are providing users with multiple formats and a custom user experience. As with all social platforms, branding is a primary focus for your efforts. The goal on YouTube is to establish a user base that subscribes to your channel, in turn enhancing the overall reach of your content and the awareness of your brand. 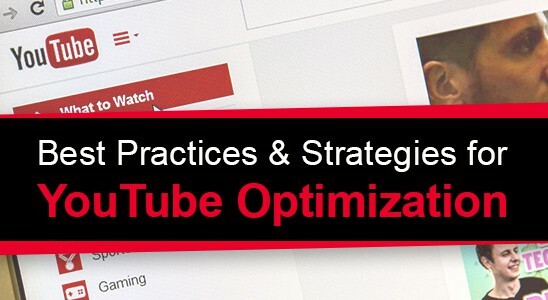 Beyond just making relevant, shareable content, a strategy for optimizing your YouTube channel that can be overlooked very easily is creating a smooth user experience for the user. You want to transform just a simple video view into an interaction with your brand. Great tools that you can use to enhance your channel’s user experience are Annotations and Playlists. Annotations are very common and can be seen as white boxes that appear during a video that are clickable and link to a page or more of video content. On the other hand, playlists group your content into corresponding categories and can be played in order so that the user gets a complete experience. Both of these tools simplify the way that users can flow from one of your videos to the next, turning that video view into a unique, positive brand experience. While all of these best practices will help you build a strong YouTube channel for your business, the one thing that each ties back to is user experience. When you think about it, the whole purpose of search engines like Google and YouTube is to provide the most relevant content for what the user is searching for. By knowing this, whenever you update your channel or create new content, always ask yourself, “Is this what my audience wants?” and “Will this improve the user experience as a whole?”. If you focus on satisfying your audience, you will naturally satisfy search engines like YouTube at the same time.